The German philosopher, Friedrich Wilhelm Joseph Schelling [1775-1854] in his Philosophy of Art [1802-3], said that “architecture is like frozen music” , a sentiment famously echoed by Goethe in 1836. Since Paul Klee, a similar equivalence has often been proposed for describing abstract painting. For many, much architecture and most painting has probably felt to fall far short of the musical, though I suspect it also depends on what music one is listening to. 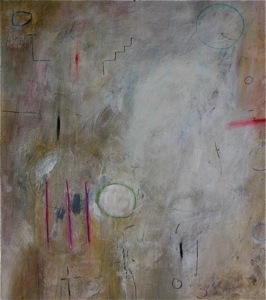 For me, my painting has been directly inspired by and in some cases explicitly linked to specific music. I’ve mentioned elsewhere the inspiration I’ve received from the jazz of Miles Davis, Monk, Ornette Coleman, and others. One composer whose music feels very close to my present work is the mature work of the Polish composer Witold Lutoslawski [1913-1994]; in particular, his aleatoric ad libitum technique that dominates his Chain compositions, piano concerto, and the third and fourth symphonies. This is especially true of much of my work on paper, which constitute a virtually daily visual diary and reservoir of ideas for my larger works on canvas. There is no explicit connection between us, but I can often hear his music in my own paintings. There is an openness and freedom in his music that I seek to express in my improvisational work. Both of us, I suspect, have our inner dread of the predictable and pre-determined.